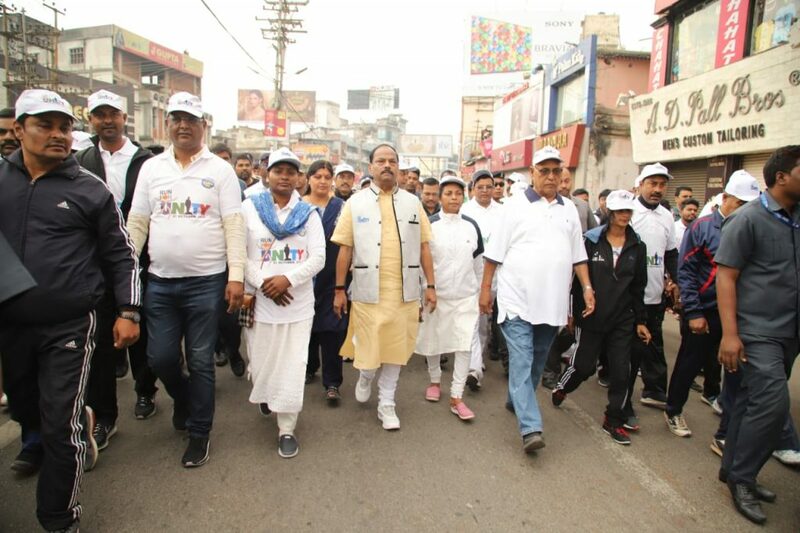 Chief Minister Raghubar Das participating in the Run for Unity organized on National Unity day in Ranchi. Ranchi, Even today, Sardar Patel is relevant. He is the symbol of unity and integrity of the country. We need to respond to powers that are working to divide us in the name of racism, caste, creed, etc. On the occasion of the birth anniversary of Sardar Patel who made more than 550 princely states a part of our country, we will take a resolution that we will keep the unity and integrity of the country intact. Chief Minister Raghubar Das was addressing people after participating in the Run for Unity organized on National Unity day in Ranchi. He said we will not let vote bank politics disrupt our unity. We have to deal with both internal and external disruptive forces. The Chief Minister said that today, the Run Four Unity is being organized for unity in the whole country. Congratulations to the children of the school, our soldiers, Kasturba Gandhi Vidyalaya, who were involved in the Run for Unity throughout the state. This gives an impression that people of the country will stand against forces that will try to divide us. Mahatma Gandhi and Sardar Patel sacrificed their life for the country, like them we are also ready to sacrifice our lives in the time of need; these messages have gone all over the world. India has many heroic sons, one of them is Sardar Patel who fought for independence and later worked for unity and integrity of the country, which is incomparable. After 70 years of independence, our respected Prime Minister Narendra Modi has acknowledged his work and given him respect. On the birth anniversary of Sardar Patel Ji, the Prime Minister of India Narendra Modi is unveiling the Statue of Unity. This is the largest statue of the world with 182 meters of height. Since the government came under the leadership of Narendra Modi, the Government of India announced the celebration of 31 October as National Unity Day. The Chief Minister also bowed down to former Prime Minister Indira Gandhi on her death anniversary. Earlier, the Chief Minister departed the Run for Unity from Sainik Market. He also joined them till Albert Ekka Chowk. He saluted the parade. In this, students of Jap, Kasturba Gandhi and other schools marched.